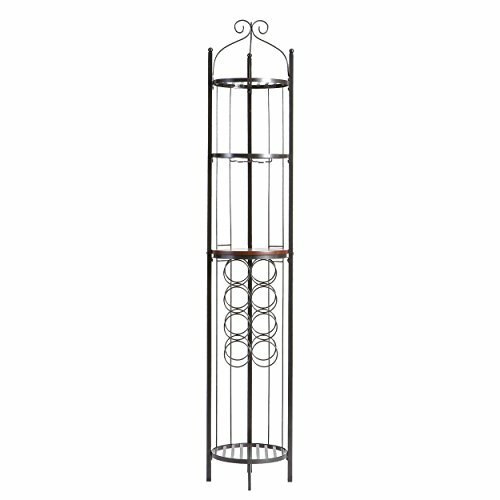 Elegant and beautiful, this wine rotunda will help with storage, display and organization all in one. With storage for 8 wine bottles, a set of glasses and whatever else your desire this exquisite round wine tower is sure to impress. The two upper and one bottom shelves are metal grate while the counter is a wooden tabletop perfect for serving. 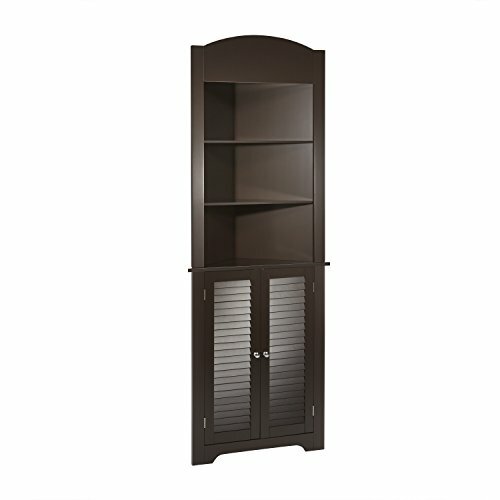 Kitchen, dining room or breakfast nook, this beautiful piece is sure to be a wonderful addition to your home. Slim, tall profile ideal for even the smallest of kitchens. Tgis wonderful piece features 3 slatted shelves, 1 solid shelf, 2 glassware racks, and 8 bottle holders and and mixed media construction. 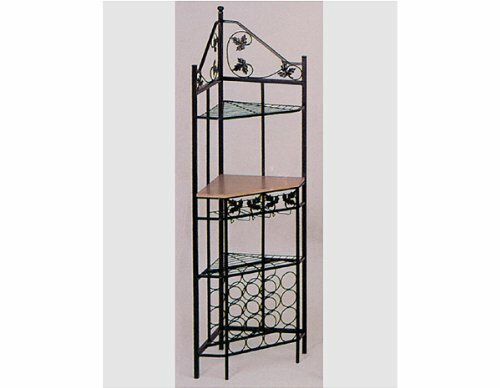 Dimensions include: Overall: 13" W x 13" D x 69.5" H; Bottom shelf: 11.5" W x 11.5" D x 13" H; Counter shelf: 11.5" W x 11.5" D x 13" H; Second shelf down: 11.5" W x 11.5" D x 10" H; Top shelf: 11.5" W x 11.5" D x 6" H. This one-of-a-kind item approximately weighs 18 pounds and supports up to 20 lb. (wooden shelf), 15 lb. (each wire shelf), 2 lb. (each glassware rack), 4 lb. (each bottle holder). Only quality materials and manufacturing will do. Product materials include: Materials: Metal, MDF w/ Veneer Counter. Assembly: Required. Made in China. Make the most of small bathroom layouts and create more functional bathroom storage space with the RiverRidge Home Ellsworth Collection-Spacesaver Cabinet. Additional dimensions: Top shelf: 27.36"W x 9.25"D, fixed open shelf: 25.25"W x 8.5"D, interior fixed shelf: 25"W x 7"D, and space between: fixed shelf/cabinet-10" floor/fixed shelf-32.25"H.
This elegant corner display étagère offers a distinctive storage solution for any room in your home, great for tight spaces because it fits right into the corner of your room. 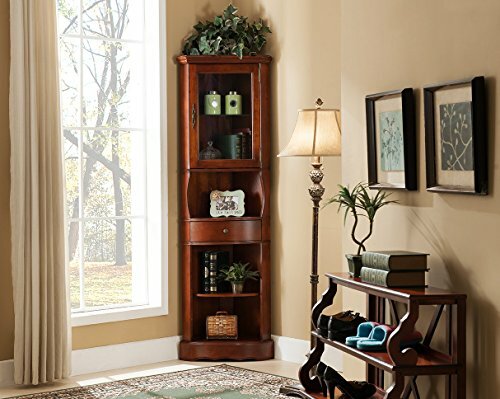 Featuring a scroll motif in copper metal provides four shelves that offer an abundance of storage space for picture frames, plants, candles and any other collectibles. Silvano Wine Rack holds 21 bottles with a removable tray. 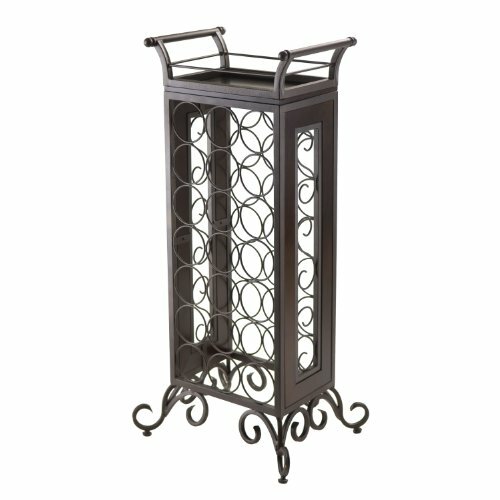 Constructed from Metal in Dark Bronze Finish and wood for tray. Tray with handle size is 15.39"W x 10.35"D x 5.08H. Tray serving surface is 11.57"W x 6.93"D. Comes with adjustable foot for uneven floors. Wine Holder diameter is 3.54". 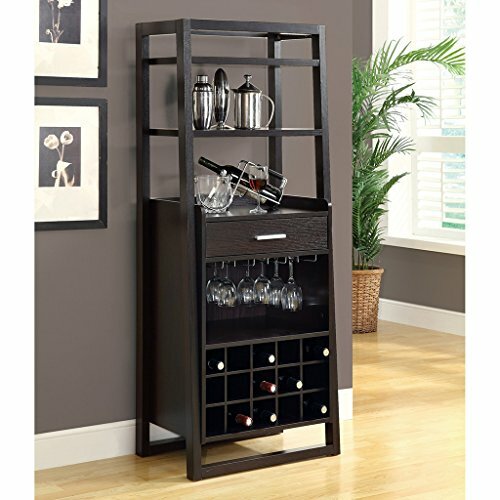 Assembled wine rack is 18.15"W x 13.50"D x 37.87"H. Assembly Required. 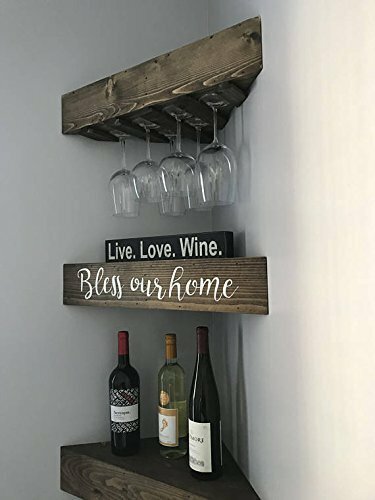 Home Wine Rack is special design to display your favorite wine selections, with 4 long stem glass holder and wine cork storage. It can hold 1~5 bottles and 4 glasses. Wall mounted style is the best way to save your space and decorate your home, Dimensions: 17.5"W x 4.8"D x 7.3" H, Metal. If you have any issues related to our product, please contact us immediately so we can address your concerns. Classic Accents: A truly inviting selection of Classic Accent Furniture FEATURING Console Sofa Tables, Wooden Wine Racks, Magazine Racks, Nesting Tables and Glass Cherry Curio Cabinets. This stylish and contemporary ladder style home bar encompasses a design that is ideal for entertaining your guests. It features a felt lined drawer accented with a silver metal drawer pull, a place to hang up to 12 small wine glasses, shelf space ideal for making cocktails, and a wine rack that can store up to 15 standard wine bottles. This cappuccino finished home bar is practical, elegant and a must-have in every home! 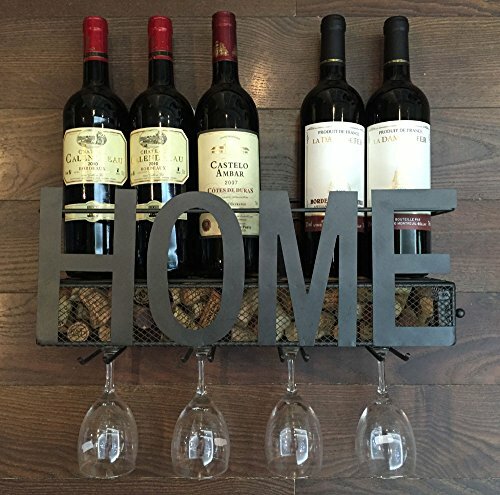 Looking for more Corner Wine Rack similar ideas? Try to explore these searches: Click Device, Pink Floyd Tie Dye T-Shirt, and Arched Headboard. Shopwion.com is the smartest way for comparison shopping: compare prices from most trusted leading online stores for best Corner Wine Rack, East Side Cat Collar, Leaf Locket, Wine Rack Corner . 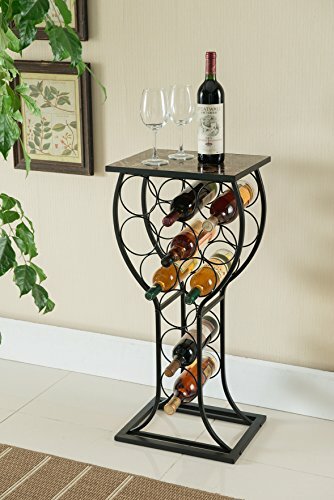 Don't miss this Corner Wine Rack today, April 20, 2019 deals, updated daily.